Despite what it sounds like, bull terriers are not actually directly related to the American pit bull terrier. Though they originated from the same ancestors, the pit bulls of today do not have direct relation to modern bull terriers. The bull terrier originally descended from dogs meant for fighting. There are bull terrier pedigrees from the 1870s, when the English stud books were first recorded. However, the breed wasn’t intended for fighting, but for use in the show ring and for companionship. Surprising though this may be, the bull terrier temperament ranking is quite high when compared to other dog breeds. We have a Birmingham breeder of fighting dogs—James Hinks—to thank for creating the vivacious bull terrier we know and love today. He crossed a bull-and-terrier with a white English terrier, and through experimentation over a number of years, he brought about an elegant, white-coated bull-and-terrier breed that presented with greater elegance and smaller stature than its predecessors. Bull terrier puppies can be expected to live from 10 to 14 years of age, though the oldest bull terrier was a female house dog in Australia affectionately named “Puppa Trout,” and was loving life through age 17. The bull terrier is known by another name, “pig dog,” in other areas of the globe. The name “pig dog” comes from the Afrikaans name for bull terrier, “varkhond.” You might be thinking that they chose this meaning based on the head and eyes of the bull terrier, which are admittedly more pig-like than other breeds. However, a look at their use gives us a better understanding—cross-bred bull terriers were used in South Africa, especially the Eastern Cape, to help the people hunt bush-pigs and warthogs. The triangular-shaped eyes are unique to this breed alone; no other breed can claim this distinctive physical quality. The big screen loves the bull terrier. The breed has made fans of many an audience member by appearing in movies including Derailed, The Last Boy Scout, A Dog’s Life, Frankenweenie, Next Friday, Babe: Pig in the City, Patton, The Incredible Journey, and Oliver!. Bull terriers have also been seen on television in Barking Mad, Keen Eddie, and Baa Baa Black Sheep. Though bull terrier puppies come in a variety of gorgeous coat patterns, the UK has a definite preference when it comes to coat color—white is the winner, though color on the head doesn’t receive penalty when in the show ring. The US also shows strong preference for brown eyes, as blue eyes are grounds to be disqualified from the ring. 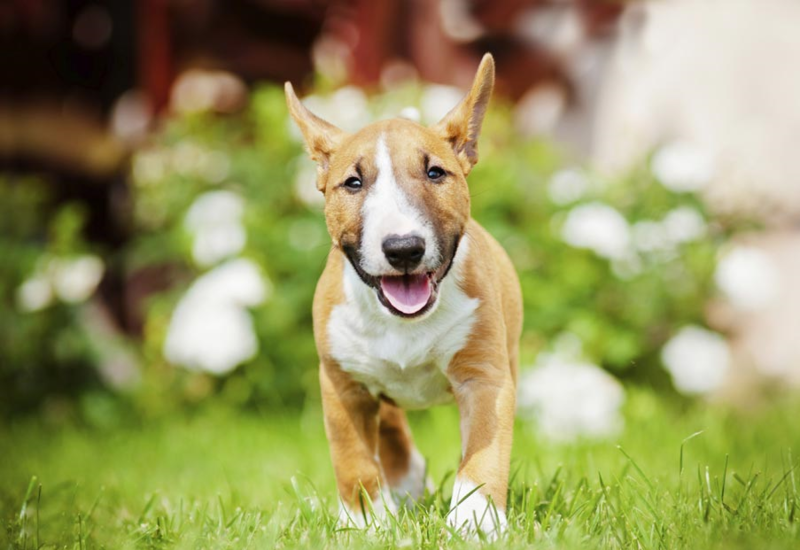 If you aren’t one to put up with yapping, the bull terrier is the dog for you—it barks only rarely, and for good reasons. So, be sure to pay careful attention when your best friend is trying to tell you something.